Utah birder Kenny Frisch loves the 1,200-acre Swaner Preserve because it provides a safe haven for more than 125 species of birds throughout the year. Frisch, who takes groups of people onto the Preserve to do some bird watching with the EcoCenter’s Avian Adventures in Migration field trips, is preparing for the next excursion on Sunday, Aug. 6, 7:30 a.m. to 9 a.m. The group, which usually includes 12 people in addition to Frisch and Swaner EcoCenter staff, will head to one of two big ponds on the land, to scan the area with a scope to see some birds. The Avian Adventures in Migration trips are strategically scheduled so participants can see as many birds as possible. “We did one in the spring during a time when the birds were heading north,” Frisch said. “The next two — the one in August and another in September — will be held when the birds start migrating back. There are usually at least 30 species of birds that breed on the Preserve at tis time of the year. Frisch — who writes blogs and posts on two local birding websites, utahbirders.com and eBird.org — said the tour group will also have a good chance to see shore birds flying south. 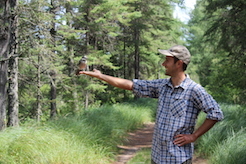 Frisch will also see if the group can spot other unique species such as warblers, flycatchers and hawks. “The thing I love about these field trips is seeing everyone’s reaction when they get a bird in a scope so they can see up close just how beautiful it is,” he said. “A lot of times they don’t have the optics to see these birds, or sometimes you can only get a glimpse of them because they are flying away. Frisch’s fascination with birds was instilled in him as a child. Frisch’s favorite bird is the merlin, a small species of falcon. “They are like an avian badass because they think they own the sky,” he said. “So when they see bigger hawks, eagles, even turkey vultures, they’ll dive bomb them. An Avian Adventures in Migration tour will run from 7:30 a.m. to 9 a.m. on Sunday, Aug. 6, at the Swaner Preserve and EcoCenter, 1258 W. Center Drive at Kimball Junction. Registration cost $20 per person or $10 for Swaner EcoCenter members. Registration is required and can be done by visiting events.r20.constantcontact.com. Participants should be prepared to hike on uneven ground and wear shoes that can get wet. Binoculars will be provided. For information, visit http://www.swanerecocenter.org.